We are called to be sons of the kingdom of God. Our destiny is to live as children of light (Ephesians 5:8). Though we live in the world, we are not of this world. Our spiritual DNA comes from above. In the Lord's prayer, Jesus taught us to ask our Heavenly Father to send His kingdom to this earth so that His will would be done here exactly as it is in heaven (Matthew 6:9-13). Though each one of us spends our days seeing the effects of the fallen world in which we live in, there is another spiritual reality at work that calls us to set our affections on things above and not on things of this earth (Colossians 3:2). Though the pain and suffering that we see with our natural eyes is very real, there is another dimension of vision that we are called to see with... The eyes of faith. 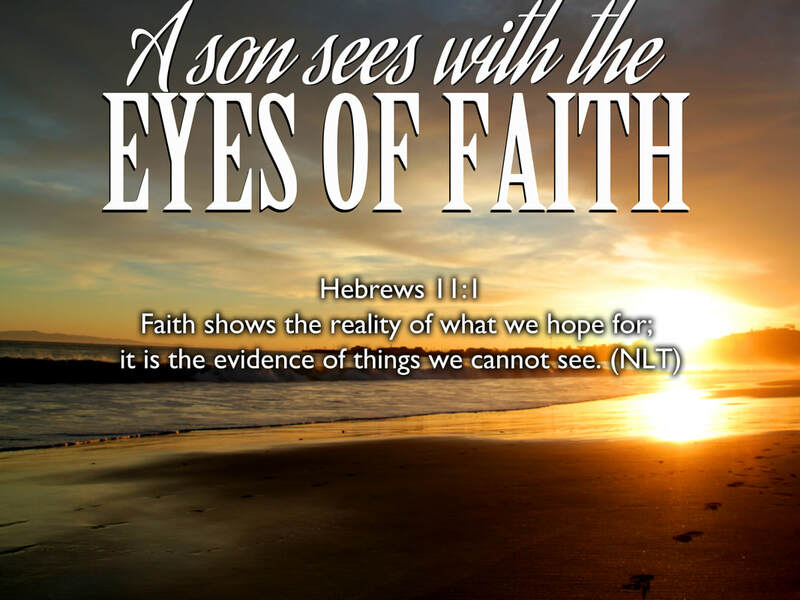 If you continue to read Hebrews 11, you will read of many biblical heroes who lived by faith in God, even though their present circumstances seemed to be in direct opposition to the plans and purposes that God had for them. We read how a man named Noah built an ark in a dry land for over 100 years. We read how Abraham left his safe and secure surroundings to go to a country where God told him to go, and then he later had a child with his wife Sarah in their old age. Time and space prevent me from talking about Moses, Isaac, Jacob, David and all of the other heroes of this chapter that lived a life seeing into the unseen and not living by their natural sight. Some of them accomplished the impossible and wrought great victories while others suffered terribly, knowing that their reward was not of this world. I believe that we have a unique opportunity to touch our Heavenly Father's heart this side of heaven when we choose to live by faith. After all, when we get to heaven, we will have no more opportunities to exercise our faith in the way we can now. My prayer today is that each and every one of us would cry out to God... “I do believe; help me overcome my unbelief!” (Mark 9:24 NIV) I pray that our God and Father would open the eyes of our hearts so that we could really see the reality of who we are and who God is. May we all have a new boldness to simply believe God to be true and come into agreement with the Apostle Paul's prayer to the church at Ephesus when he prayed that the eyes of their hearts would be opened so that they would know the hope of their calling... whether their earthly circumstances lined up with the heavenly reality or not!